Former Cabinet Minister Dr Mo Mowlam opened a major new contemporary art exhibition in London’s East End entitled FlyMO — all the works were specially selected and curated by herself of works by 12 artists chosen from 300 slides. 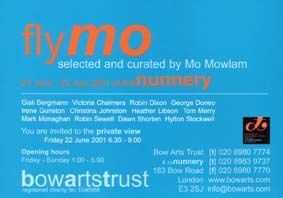 Dr Mo Mowlam had become involved with the Bow Arts Trust two years previously after giving in to “retail therapy” and buying a picture by one of the Trust's artists. When asked to front the exhibition Mo, who had a passionate interest in the arts, said: “Curate an exhibition? Me? Later adding "I didn’t have time to hesitate. To quibble, to hum, to ha. So I hope you find it as exciting and invigorating as I have. “The collection I have chosen is sometimes accessible, sometimes challenging, a little bit serious and a little bit fun. All of them are works which engage the viewer, raise questions, raise eyebrows and, I hope, the occasional laugh. In other words pretty much what Bow Arts is about." Dr. Mo Mowlam later became a Patron of the Bow Arts Trust and played an active and supportive role untill her sad passing away in August 2005. The Staff, Trustees and members of the Trust extend their deepest sympathy to Mo's family.